Villa Chok is a two-storey three bedroom island paradise located in the Ban Tai Estate on the island of Koh Samui, Thailand. 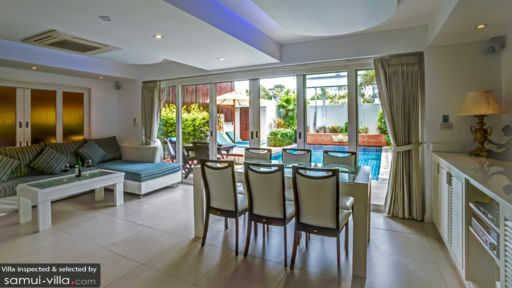 With its proximity to the beach, various in-house activities such as the option for an outdoor cinema, friendly and accommodating staff, and its location in one of Thailand’s most happening islands, Villa Chok is one of the best choices for a tropical getaway with your family and friends. Come and have a memorable holiday experience here at Villa Chok! Villa Chok’s master bedroom, located on the ground floor of the two-storey villa, is a spacious comfortable area. With its clean design and choice art pieces, you will feel that this is a space you can truly relax in. The master bedroom also comes with a en suite bathroom with a large stone tiled bath. The master bedroom also has easy access to the second floor. If you want some fresh air, the room also has a private terrace easily accessed through double doors. There are two guest bedrooms located on the upper floor of Villa Chok that are amply spaced and designed to bring you utmost comfort. With wooden accents and choice furnishings, these guest bedrooms are sure to be a stylish yet relaxing place for you to get a good night’s rest. Each bedroom has a double bed and a semi open plan ensuite bathroom. In one of the bedrooms, you can step out onto the private balcony, sipping your morning tea or coffee, while gazing out at the pool and garden area below. Villa Chok’s outdoor space reflects the calm and tranquil nature of the island’s natural resources. You can enjoy the various plants, shrubs, and trees peppering the lawn, while laying back on one of the two sun loungers by the pool. Here you can relax and soak in some sun or sip on a mango shake while reading a favorite novel. You can also take a dip in the swimming pool and gaze up at the beautiful blue sky. In the evenings, you can lay back on the sun loungers or sit comfortably on one of the chairs in the dining area as you enjoy the outdoor cinema, with its 3 meter screen. Villa Chok’s outdoor space is truly a relaxing place to be. Villa Chok has an open plan living space designed with white washed walls and furnishings that are functional. The space flows easily from the master bedroom to the pool and garden area. In the living space is the lounge area with a comfortable L shaped sofa and flatscreen TV. This is next to the dining area with its six seater dining table that overlooks the pool. In the evenings, the dining area is also a good spot from which to watch the projected outdoor movie. 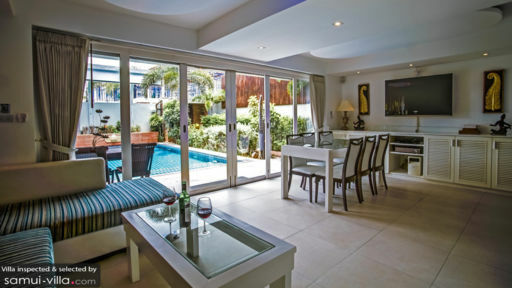 Villa Chok’s living space also comes with a kitchen in which delicious meals can be prepared by the chef. Here at Villa Chok guests will feel pampered and well taken care of as the staff work hard to give you the best of Thai hospitality. There is an on-call concierge service that will help you with your needs: from booking various activities to transportation inquiries, the staff will be happy to assist you. Aside from the on-call concierge service, there are also a variety of other services guests can avail of at the Ban Tai Estate, such as yoga classes, spa treatments, a private in-villa chef, and room service. Villa Chok is located in the Ban Tai Estate on the island of Koh Samui, Thailand. In the estate is a pond and a beach, which is 300 meters from the villas. While there are a number of shopping, retail, and dining experiences on the island, you can also take a trip to Angthong National Marine Park where you can hike, snorkel, kayak, and more. Here you’ll be able to get in touch with nature. 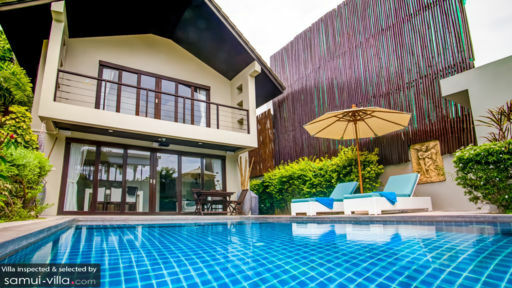 Villa Chok is the perfect getaway for families that want to experience island life in Thailand with some relaxing and fun attractions and activities nearby. The place is just as described on the web. Very modern and spacious and well equipped. The host Oleg and Victoria are both very nice. The house is about 300 meters away from the beach which is nice and very quiet. Overall a very nice stay! Villa was clean and modern with great facilities. Staff very helpful and on call for all of your needs, car hire and tours can also be arranged by villa manager. Very quiet and peaceful location but still close enough to drive to chaweng beach for nightlife. Me and my friends had an amazing time in the villa! It is very nice place, close by such a peaceful and quiet beach with nice restaurants. The manager on-site Wassana helped us a lot and so quickly! Such a great experience! We will come back for sure!Thanks!